Microsoft's Live Mesh Service has been around for a while as a limited entry program for a while. 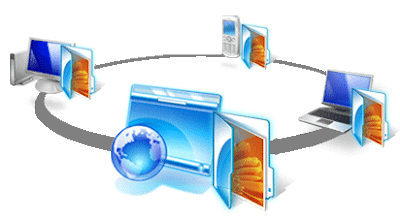 The service allows users to synchronize data on multiple PC's and all over the web. So if you need to synchronize any data that is on your one PC and you need it on other, All you have to do is use Mesh's Service. The service had been made open to all US users with just a single sign in using Windows Live ID. Just Install the Live Mesh software onto the PC's you need to synchronize and you get started. It synchronizes all your data in the background and you can access it at another PC anytime you wish. This means no more sending Files, just share them. When you sign up to Live Mesh, you get 5 GB of space to store and share your Data.And if Microsoft are to be believed, Soon enough you can even share and synchronize data between PC's , Macs and even Mobile devices. But as of now its all about synchronizing PCs only. You can visit Live Mesh and get started. Currently the service preview is an invitation only for International Users, so if you want to get a sneak peek, sign up with your Windows live ID and joining the Waiting list. Frankly speaking, this is a better prospect for the Working professionals, who just need to share docs and Presentations. Regular users would find it quite less.